Katherine Kate Burton is a Swissborn WelshAmerican actress, daughter of actor Richard Burton and Sybil Burton. 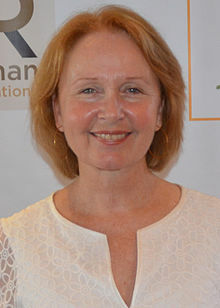 On television, Burton received critical acclaim for performances in Shonda Rhimess drama series as Ellis Grey on Greys Anatomy, and as Vice President Sally Langston on Scandal. She has been nominated for three Primetime Emmy Awards and three Tony Awards. Burton was born in Geneva, Switzerland, the daughter of producer Sybil Burton and actor Richard Burton . She was thus the stepdaughter of Elizabeth Taylor and of Sybils second husband Jordan Christopher, both actors. Burton earned a bachelors degree in Russian Studies and European History from Brown University in 1979, where she was on the board of Production Workshop, one of the universitys student theater groups, and a masters degree from Yale School of Drama in 1982. Brown awarded Burton an honorary doctorate in 2007.